Long before TBC was released, Blizzard decided to use a new class based reward series to encourage players to head to the swamp, and explore The Temple of Atal’Hakkar, more affectionately known as The Sunken Temple. The quests series becomes available to each class once you hit level 50, and is given by one of your trainers. Each class has to venture deep within The Sunken Temple, and kill a series of bosses. Once complete, they each have a unique choice of rewards to choose from, that won't be found anywhere else. For some classes, the items are all quickly replaced by gear found in the lvl 58-60 dungeons. But a few end up with a reward that can still be seen in use at 70. 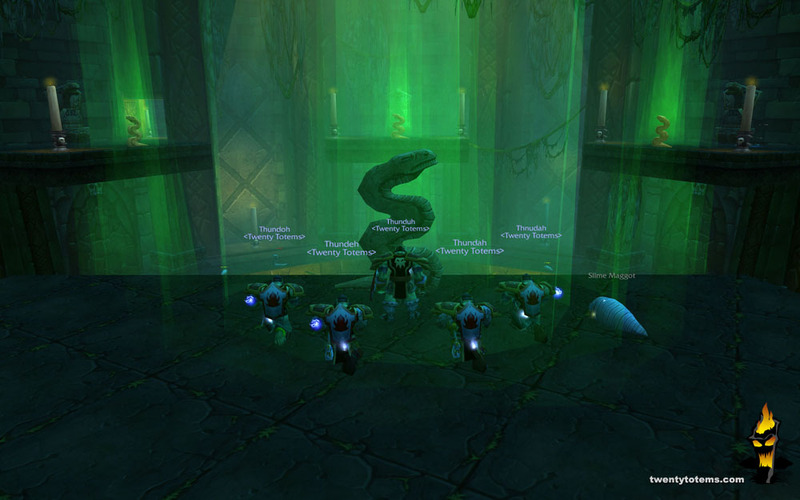 The Shamans fall into the second group. 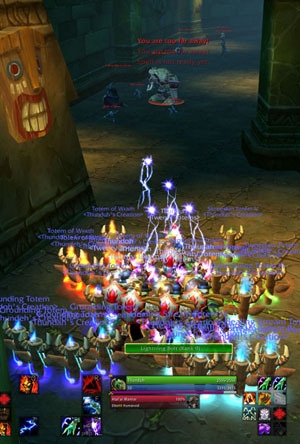 The Shaman's Quest is called Da Voodoo, and considered a level 52D quest. (The D means you'll need a group to head into an dungeon/instance) There are a series of 6 Troll mini-bosses that must be killed, and a feather collected from each one. While two of the three reward options are simply "nice" gear for a level 50, (Azurite Fists, Wildstaff) it's the third option that nearly every educated Shaman grabs... The Enamored Water Spirit. This trinket, when used, acts exactly like a normal Water Totem. It even takes up your Water Totem spot, and will be wiped out immediately if you drop another Water Totem. The thing that makes this special, is that the mana it gives you is more than double that of a Mana Spring Totem at that level, and still nearly 30% more than a Mana Spring Totem at level 70. The difference of course is that A: it takes up a trinket slot, and B: it only lasts for 24 seconds then has a 3min cooldown. For any Shaman, this is obviously a very valuable item to have. For a multiboxer playing five Shaman, it's priceless. 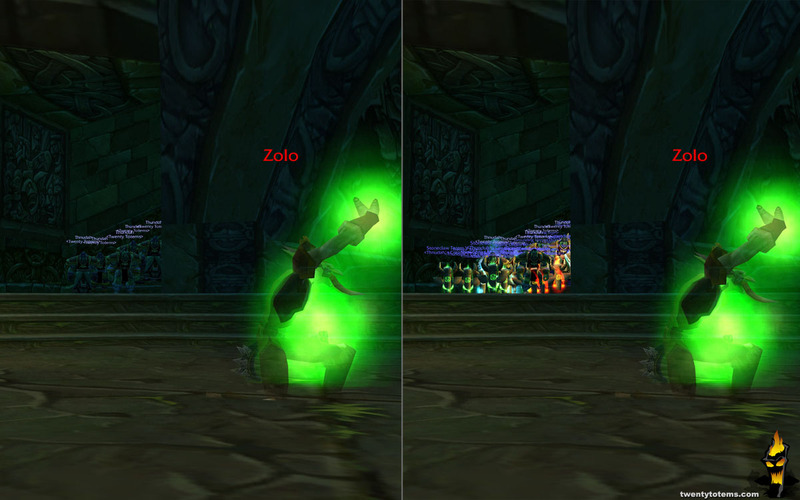 I'm working on changing my healing totem macro to have my 4 alts drop their Enamored Water Spirit instead of a healing totem every 4th use. The reason I don't use my main, is becuase of the cooldown. Up till now, when I drop healing/mana totems, my main drops the Mana Spring Totem, while the other four each drop a Healing Stream Totem. I do this because the Healing Totems stack, while the Mana doesn't. By rotating a Water Spirit Totem through each of my 4 alts, I end up losing a healing stream, but gain significantly more mana. The other issue is the short lifespan of the Enamored Water Spirit which ends up going away before a fight is over. So I keep dropping a normal Mana Spring Totem, which last 2 mins. 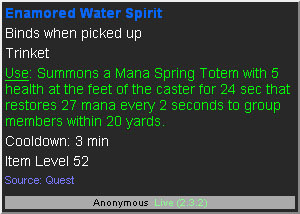 So when the Water spirit dies 24 secs into the fight, the Mana Spring takes over until I drop totems again. It works great, and my mana issues are gone. I can just about chain pull (no CL pun intended) :) through instances. So it's obvious why I'd want to get these ASAP. So when the boys all hit 50, I grabbed the quest, and headed directly to The Sunken Temple to see if I could survive in there with 5 Elemental Shaman, and no dedicated healer or tank. Holy cow was that fun. My very first pull was of a pair of lvl 48 Elites, who both died before they got to my group. I actually LOL'd. (Is there an acronym for that? Something like "ALOL!") 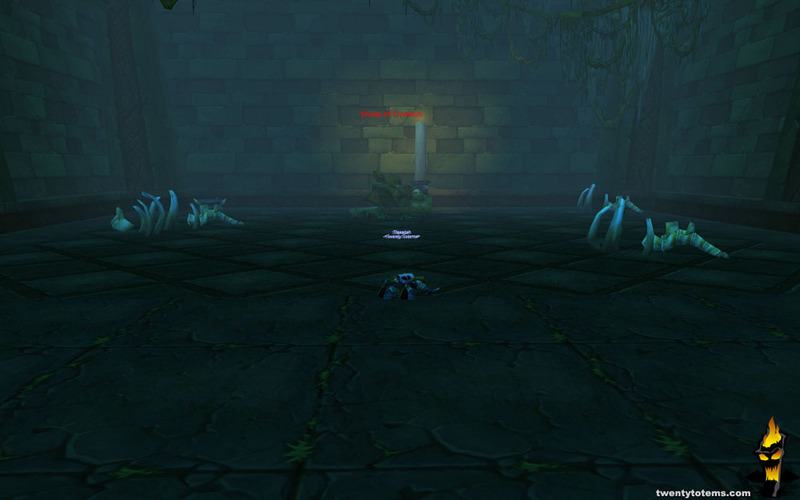 I proceeded quickly upstairs to try and drop the 6 Troll Mini-bosses I needed to finish my Shaman quest. 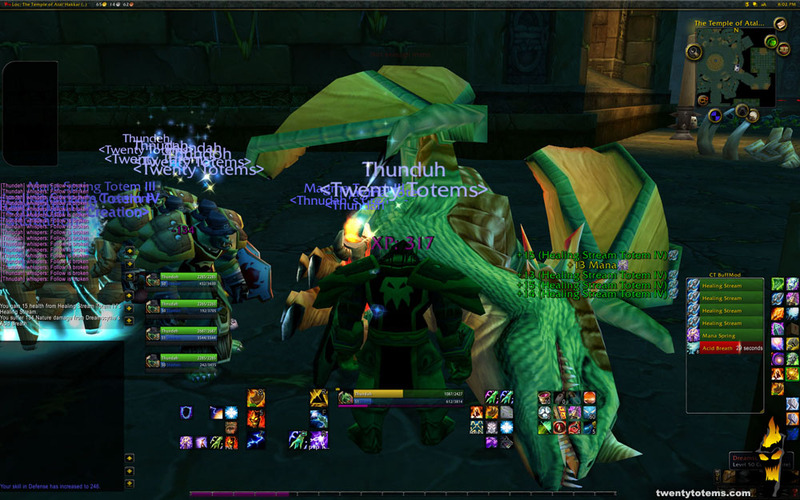 The hallways are filled with fairly large groups of mobs, which make for some crazy pulls. There are also one or two pathers, who love to throw their wrench into things if you don't keep good tabs on them. Each group included 3-5 Elites and 4-5 non-elites. That's a big pull. What eventually worked best, was to isolate the different groups. We have 3 types to worry about. Elite Melee, Elite Casters and non-elites (all melee). The casters are the easiest to handle. They die last. Why? Because of the irreplaceable Grounding Totems. They give each of my Shaman a buff, which acts as a diversion for spells. When one of the caster mobs sends fireball (or any other spell) towards one of my guys, the spell gets rerouted to a Grounding Totem, and kills the totem instead of hitting a Shaman. The beautiful thing about this, is that if the two casters target the same fella, and cast at the same time, (which mobs do) then both spells can be eaten by a single totem. With five of these on the ground, they can pretty much empty their mana bars into totems. When their misdirected spells wipe out 4 of my 5 totems, I simply drop a new set. By the time the first Lightning Bolts hit the first Elite Melee, and pulls the group, I /assist my main, and each Shaman has the second Elite Melee targeted. The second volley heads off towards the first Elite Melee, and I start casting on the second Elite Melee even before a mob gets to my group. Then finally I fire off at the Elite Casters, who at this point are still trying to cast at my Shamans, only to have their spells eaten by the Grounding Totems. I quickly found myself peeking around a corner at the first miniboss. I was pretty nervous about this. I had no idea how hard he would be. So I filled the tiny hallway with twenty totems, popped EM and BF, then sent a storm of lightning his way. He dropped before he got to the group. I ALOL'd. I worked my way to all 6 Trolls and got the items I needed to finish my Shaman quest, but I was WAY too hyped up to go turn it in. I wanted to see how far I could get! 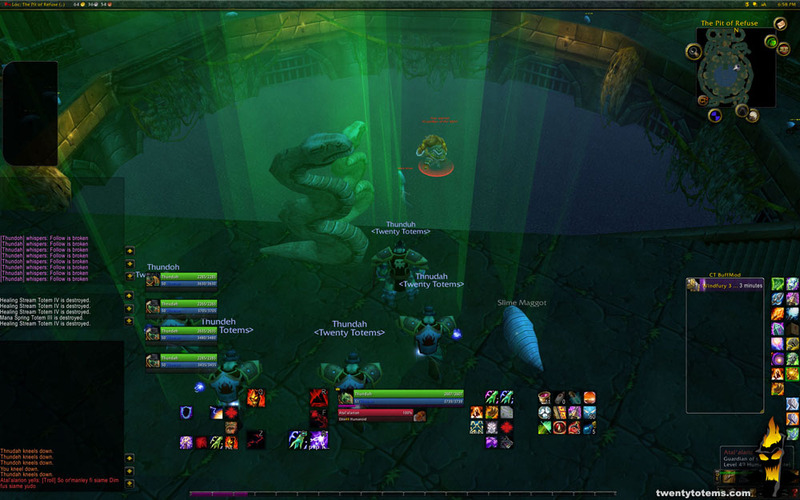 So I headed to the basement to trigger the 6 Snake statues, and fight my next ST Boss, Atal'alarion. He dropped quickly too, and I figured I needed to head upstairs and fight something bigger. I found my way to the Draconian area, where the pulls include swarms of Whelplings and a few Dragonkin. The first pull was a wakeup call. These guys hit hard, and I didn't have a tank. I lost two Shaman on my first pull, but survived. I changed up my strategy a bit, and found dumping Chain Lightning into the elites after pulling the whelplings, helped up the DPS. I had a quest to kill Jammal'an the Prophet, and I really wanted to see if I could pull it off. The groups of Trolls that guard his room are notorious for fearing groups of pugs into other groups, and quickly wiping everyone. Knowing this, I first started pulling them all the way into the previous room, which is a tactic used by most experienced players... but I noticed really quickly that I was killing them really fast. So instead, I stayed in the room I pulled them from, kept a Tremor Totem up just in case, and ended up DPSing them down before they could fear. It was great fun. So I dropped a pile of Grounding Totems for the add, and proceeded to down Jammal'an the Prophet before he even got to us. Beautiful. After that I continued on towards the final boss, but found myself facing 4 of his Dragon minions, who turned out to be immune to Nature Damage. This means no lightning bolts, no chain lightning, no earth shock. All I have is Flame Shock, and some fire totems. It was terrible. I wiped many, MANY times while I worked out position, spells, etc. But eventually I made Shade of Eranikus. Eranikus hits very hard. VERY hard. But I hoped I could DPS him down before he got to my group. I dropped the totems, fired up the boys and woke the sleeping Dragon. He was immune to Nature. He hurt us. He hurt us like he was enjoying it. I think I saw him smile. I decided that was enough, was thrilled to get this far on my own, and called it a day. The only boss I didn't face was Hakkar, only because you have to do a quest before hand to summon him, and I've yet to do it. Ah well, I'll be back. It's really interesting how shaman get better the more there are. 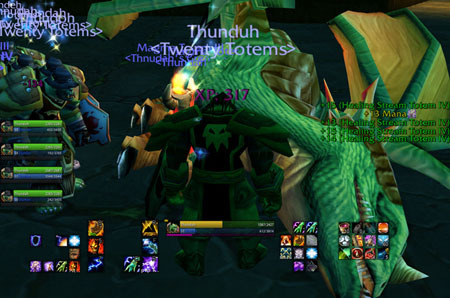 Obviously all classes benefit from multiboxing but the totems and items such as the water totem trinket improve each member instead of just creating more if that makes any sense. 5boxing mages for example would give you 5x the firepower but they would still have the same disadvantages such as squishyness, having to stop to drink, etc. But it seems that totems make the INDIVIDUALS in a group so much better. Stats, downtime, damage and so on in a way that even other hybrid classes can't. Enough rambling, great blog Boom I'll continue following it closely. I think I've heard you mention that you use an addon to manage all your macros. Care to share what it is? I've found a few myself, but they're buggy and outdated. Actually I don't. For now I've found the best way to write my macros is still in notepad, then simply copy/paste them into each instance of WoW. Because so many of the macros have to be the same, but slightly different on each toon, (especially for macros that rotate jobs) it helps me to see them all next to each other in 5 notpads on my main screen. You can actually edit a file in the WoW directory, but most of the players who have done this find little to no advantage to it.